I am a European history adjunct lecturer at several local colleges and as part of my introductory Western Civilization classes I teach them about the waves of 19th and 20th century feminism. 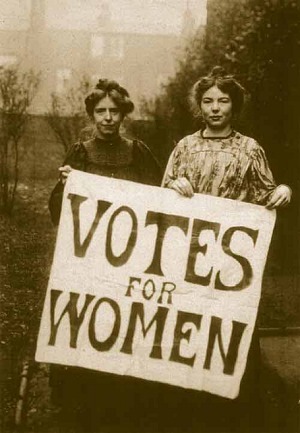 I teach my students about the progress and activities made by women such as Caroline Norton, Josephine Butler, Alice Paul, Lucretia Mott, Elizabeth Cady Stanton, Susan B. Anthony, Anna Howard Shaw, Florence Nightingale, Clara Barton, Emmaline Pankhurst, Millicent Fawcett, Emily Davison in the first wave of feminism. I also stress the unique literary gems which have been created by feminists, though the word itself might not have been a word that they identified fully with. I teach them about women who wrote astounding works that have proved women’s abilities to write moving and fascinating books, women such as Mary Wollstonecraft, Olympe De Gouges, Jane Austen, Charlotte and Emily Bronte, Vera Brittain, Virginia Woolf, Gertrude Stein, Djuna Barnes, and Radclyffe Hall. Olympe De Gouges, who wrote The Declaration of the Rights of Woman and Citizen, was executed for her radicalism in the days of the Terror, in 1793. Jane Austen and the Bronte sisters, authors of books like Pride and Prejudice (Austen), Jane Eyre (Charlotte Bronte) and Wuthering Heights (Emily Bronte), lived and wrote at a time when some opprobrium was attached to women writers, and the Bronte sisters used pseudonyms in order to get published. Virginia Woolf, the author of A Room of One’s Own, first connects the inability of women writers to be accepted as writers to their lack of the material comfort, income and right to privacy which male writers could easily demand and receive. I am continually amazed by the ignorance of my students, both men and women. Almost none of them have heard of most of the women in these lists. The only women whose names they have heard of are Stanton, Anthony and Austen. And my students will have not read any of the books, pamphlets or speeches which these women have made. Occasionally I find some students will have watched movies based on Jane Austen’s works, but that is all. I find this state of knowledge among the youth deplorable and wonder why their knowledge is so minimal of these feminist pioneers, who risked so much to change the world in positive ways. One of the activities we as modern feminists must do, I believe, is not allow the work and sacrifices of the women of the past to be forgotten. Students now are so jaded by the regularities of modern life that they don’t stop to think how different the world was for women of the past. Yet there is still discrimination against women, both subtle and overt, and still double standards that blame women for being raped, and still harmful stereotypes perpetuated in the media and by politicians. There is still work to be done. And amidst doing that work, the women of our past who have already done so much, ought not to be forgotten. Woolf’s statement that a woman needs a room of her own and an independent income to write good fiction, things which women usually didn’t have in 1929, still applies and can be broadened to include a woman being able to fulfill so many other goals. I hope that in the future my students will pick up a book by one of these women, or read one of their speeches, and adopt their goals as their own. We can still learn a lot from our foremothers but first we have to know who they were, and what they did and said. This entry was posted in Uncategorized and tagged 19th century feminism, 20th century feminism, alice Paul, Anna Howard Shaw, Caroline Norton, Clara Barton, Elizabeth Cady Stanton, Emily Bronte, Emily Davison, Emmaline Pankhurst, feminism, feminists, Florence Nightingale, Josephine Butler, Lucretia Mott, Millicent Fawcett, Susan B. Anthony, teaching, The Declaration of the Rights of Woman and Citizen, women's history. Bookmark the permalink.